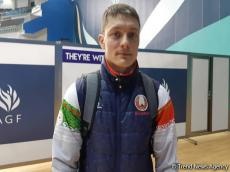 Belarusian gymnast Andrei Likhovitsky, participating in the FIG Artistic Gymnastics Individual Apparatus World Cup in Baku, was pleased with his performance in qualifying competitions. “Of course, I wanted to get to the Cup in the exercises on three apparatus, but I went through two,” he stressed. Likhovitsky went to the World Cup finals in exercises on the crossbar and on parallel bars. The Belarusian gymnast noted that the organization of competitions in Baku is always at the highest level. “I'm here at the World Cup stage for the second time, I was also at the European Games in 2015. Competitions in Baku differ from others in terms of the level of organization and hospitality. The gymnastics arena is comfortable and the audience supports well, which is nice,” he said.